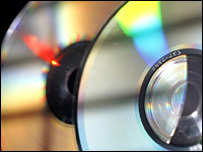 CD sales are remaining bouyant in the UK, retailers say. UK music fans continue to be the biggest buyers of CDs in the world, according to retailers. They say UK fans bought an average of 2.7 CDs each in 2006, well ahead of second-placed Norway and the US, whose citizens bought an average 2.1 CDs. Retailers say this proves CD sales are healthy compared with other countries, despite competition from digital sales. Rock band Ash said this week they would not release any more albums, opting to release singles online instead. It is the fourth year in a row that UK music fans have been the biggest buyers of CDs. While CD sales are slipping, and sales of downloaded music are rising, the Entertainment Retailers Association (ERA) says British consumers are still happy to buy their music on disc. ERA director general Kim Bayley said: "The rise of downloading in the singles market may have captured the headlines over the past couple of years, but when it comes to albums, UK music fans still overwhelmingly prefer the convenience and flexibility of digital formats." Digital sales still accounted for less than one-twelfth of the music market, she added. In 2006, 164.4m CDs were sold in the UK, down on the 172.6m sold during the previous year. The association represents music chains, independent shops, supermarkets and digital retailers. Traditional record shops have had a tough time battling against the rise of internet sales as well as competition from other sources. HMV launched a "radical" review of its business earlier this year, while the Music Zone chain folded in January, selling its stores to rival Fopp.